I went into Hologram for the King not knowing quite what to expect. Would it be the Dave Eggers of years ago, writing in an brilliant, over-the-top narrative voice or would it be the recent Dave Eggers, whose Zeitoun and What is the What completely blew me away for the story and the writing? It turns out that Eggers is a more reserved writer than he was as a young gun (I’m not complaining but I do miss a bit of that energy), and now goes deeper into characters. 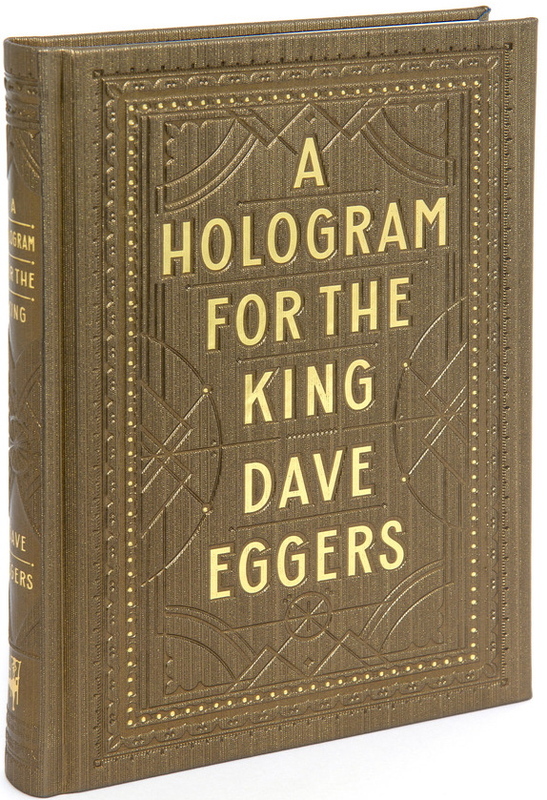 Hologram for the King is a modern story, of Alan Clay, who is in Saudia Arabia trying to make the deal of his life (pitching a large technology contract to the king) but instead, he is stuck in a Waiting for Godot-like parable of life. Eggers brings us into the complicated inner life of Clay, whose hanging on by a thread and navigating an unknown country, waiting for the king to arrive. I can’t say there is a whole lot of plot here. There isn’t. But there is something interesting about the inner journey of a single character, and Eggers does pull it off, with reserved writing and focus. 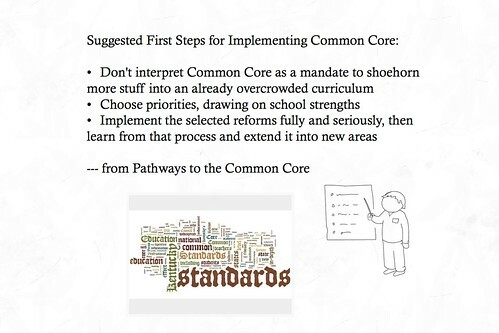 I love this short list of advice in the Pathways to the Common Core book. I’m a sucker for trying out new tools, just to see the possibilities. Here, I received an invite to a new site called PowToons that might be another alternative to powerpoint and prezi as a presentation tool. It builds a bit off the idea of a comic interface. I used it to create a short poem, as part of a discussion in another online space around writing. We’re exploring connections between the Make Movement and writing/literacies in a digital age in one inquiry group that I am part of this summer. I thought a video by David Gauntlett (the image is a screenshot from the video, embedded below) really established some firm connections along key points: that agency is in the hands of the creator to make something new out of existing materials (even digital material); that the activity of making shifts consumers away from mass-produced materials and therefore, provides an individualistic sense of creation; and that the social element of digital literacies has the potential to increase engagement and heighten the creative element of making something that will impact the world. “that does not allow everyday people to share their vision” as opposed to new media sites that do allow for that (although he admits that we should not fall into the dichotomy of television-bad/digital media good – there’s a lot of crap in digital realms just as there is a lot of quality programming on television). His lecture had me thinking about the ways to make more connections between how we encourage our students as creators of content, and not just passive users. I’m fan of A.J. Jacobs. I’ve learned a lot, and laughed a lot, with many of his books, which are focused forays into various themes in which Jacobs writes in the midst of the experiences. He’s read the encyclopedia. He’s explored outsourcing his life. He’s lived by strict biblical rules. And now, with Drop Dead Healthy, he wants to get healthy. He does, and over the course of two years, Jacobs explores many facets of our bodies, our visions of health, and dips his way into all of the alarming and contradictory research around various health claims. Jacobs also brings us into the warm relationship he had with his grandfather (a legendary lawyer from New York) and his quirky, passionate aunt, who rails against modern society’s ignorance of health. Both of them pass away during the course of the two years that Jacobs was writing this book, and he honors their lives by situating them within the context of the larger story about living life to the fullest, and healthiest, and determining what is important. While I enjoyed the explorations of health, including all of the wacky experiments that Jacobs takes on (his poor wife! ), the threads of his family held the book together for me in an emotional way. I also appreciated Jacobs’ conclusions around what he learned, and the final scene of him holding the sticky hands of his son (munching on cotton candy) is touching. I’m in charge of a writing prompt over at a P2PU inquiry group around digital writing. My topic is to connect writing with “making,” and creating, and as part of that discussion, I shared my view that we need to make sure we are using technology to provide avenues for shifting kids from consumers to creators. 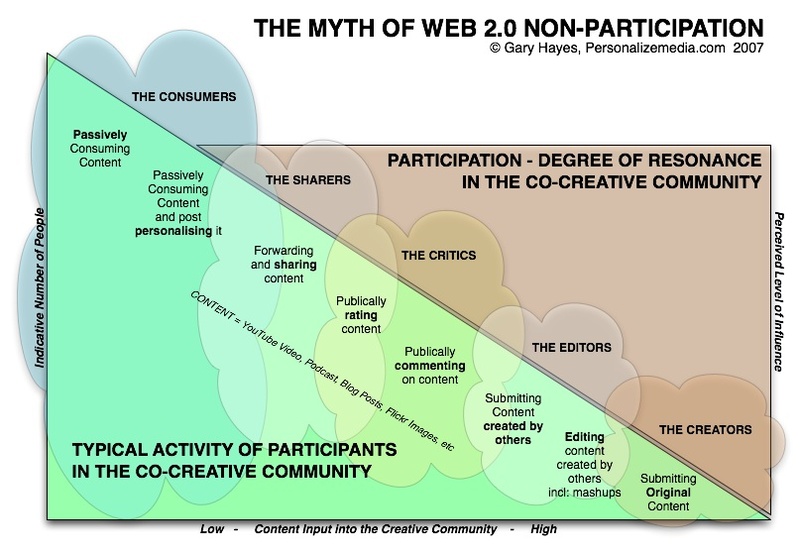 A link to this chart by Gary Hayes was an interesting connection, too, for while it looks at the ways that people participate (or don’t) in online spaces, it also maps out the role of consumer versus creator. 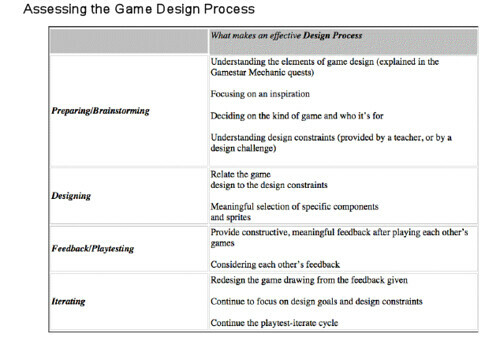 One of the questions I pose to our inquiry group: where are YOU on the chart? What about you? Way back in early spring, I wrote about being a coach with my son’s Little League team for Slice of Life. Well, the season just ended (believe it or not) with my son’s team having a great regular season and a weak All-star season. 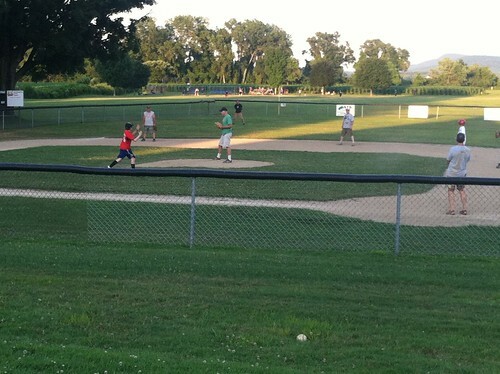 But, we had a blast, and on the last practice, we had a fun game of adults versus kids baseball. 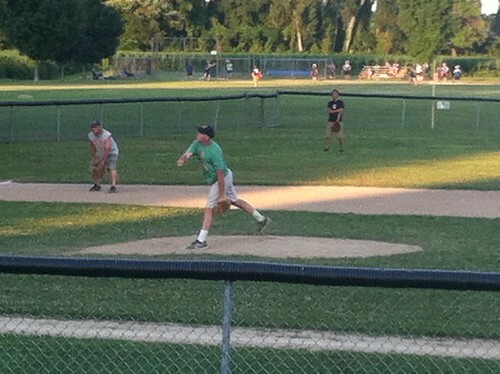 The pictures here are of me, pitching to the boys. Yeah, my arm hurt the next day but it was worth it! And the game ended on a tie: 3-3. Daniels, Zemelman and Steinke give a nice overview of the importance of writing to learn, no matter what the class, and then offer up possibilities for the classroom. The book begins with a series of quickwrite activities, and then ventures into longer project-based options, and ends on an interesting chapter around writing for standardized tests. This structure, plus the breezy style of writing, makes the book very accessible for a wide range of audience. There is a lot of practical advice, including sections on “what could go wrong” for teachers to consider when implementing the ideas. There are helpful connections to real classroom examples, and then further connections to the science, math and social studies classroom experiences. I think the book will be a hit with teachers in our professional development. Personally, I enjoyed the project-based writing chapters (what they call public writing) and have become intrigued once more with the i-Search paper format, which has nice connections to research skills and inquiry writing by students. 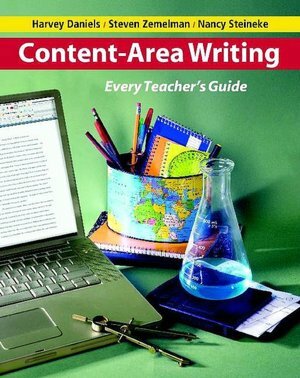 In fact, after reading Content-area Writing, I am now intending to start the year out with an i-Search project with my sixth graders in September, helping them early on in the year with some research and analytical skills that will hopefully set the stage for longer pieces as the year progresses. (The i-Search idea is built around choice, inquiry and writing). Last year, we didn’t get to research and essay exploration until the end of the year, which did not help my science and social studies colleagues out in their content-area classes all that much. An Introduction to the GSM Online Learning Course from E-Line Media on Vimeo. I am trying to take advantage of a partnership between the National Writing Project and Gamestar Mechanic to learn more about the summer design project that Gamestar has launched for kids. Young gamers enrolled in the online program use webinars and one-to-one coaching and game-building activities with professional game designers to learn more about designing video games. I’m hoping to pop into some of the discussions and take part on the outskirts of the activity, as much as I can. 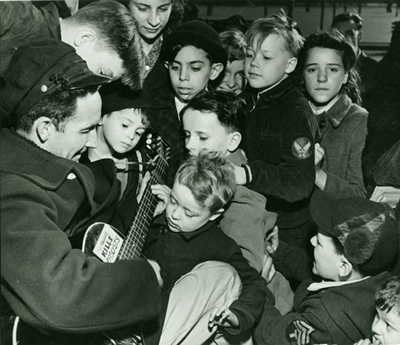 You may not know it, but today is the 100th anniversary of Woody Guthrie’s birth. There was a big lead article on one of our alternative newspapers this week about the 100th anniversary because Guthrie’s granddaughter is performing his songs at a local concert (Arlo Guthrie lives not too far away) and the article reminded me of the power of Guthrie‘s songs and fierceness of message and heart. One of my favorite Steve Earle songs is this tribute to Woody, called Christmas in Washington about the state of politics. I hope you enjoy it and remember Woody as an American icon.